For some reason that’s a topic we haven’t brought up much yet in more than two hundred and sixty reviews spanning the first year and a half of rock ‘n’ roll. We’ve danced around the subject a little when discussing artists heading in different stylistic directions, but for the most part we haven’t considered what seems to be a very obvious – and constant – issue all artists and record labels face when entering a studio to cut material that will make up their next release. Just what is their goal? A hit record would probably be the answer most likely to be given. After all music is a business first and foremost, not a hobby or an expensive form of indulgent self-expression. If your records don’t sell you won’t be making music that anybody has the chance to hear for very long. Thus you need to find a way to have that music reach a wide enough audience and be appreciated by those listeners to give you the freedom to go back and cut another record… and another and another. But there remains a very clear cut difference between seeking hits and chasing hits and thus you’re faced with the stark reality that all hits are NOT created equal when it comes to securing your legacy. 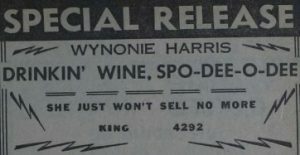 Just to get it out of the way in case there was any doubt, Wynonie Harris’s Drinkin’ Wine Spo-Dee-O-Dee was in fact a hit. A very big hit at that, reaching #4 on the Billboard charts during a thirteen week stay. Though he had five songs in his career that reached a higher position than this, “Wine” had the third longest reign on those charts, giving some indication as to its potency. So to get back to the question about what their goals were, chances are they all felt this record achieved that primary goal of commercial success and then some. It’d be hard to argue against it in fact. But what about creative goals? Where did it land on that scale? Did it do anything for his reputation as a leader in the rock field? Did it elevate him to another level of stardom? Did this record help define him? Did this record, this specific version of this song, define rock itself at this stage? Well, I think the answer to those questions is also pretty clear. Despite its hit status at the time and even with the record’s content which was right in Wynonie Harris’s wheelhouse and plays into his enduring image perfectly, the signature take on the song remains with the artist who originated it, Stick McGhee, an otherwise largely forgotten figure on the outskirts of history. Harris’s claim to the song is negligible at best in an historical view. Hell, even the most popular Wynonie Harris hits collection on the market for years was Rhino Records’ Bloodshot Eyes, and the one hit it left off entirely was this one! So in a way Drinkin’ Wine Spo-Dee-O-Dee is something of a curiosity to look at in the Twenty-First century. A case of having a huge name and a pretty sizable hit that has been overshadowed completely by McGhee’s original to the point where most reasonably well-informed fans of early rock who wouldn’t have to take more than a nanosecond to get out the name Stick McGhee when asked what artist did this song would then might need their memory jogged to remember that Harris also tackled it successfully. He wasn’t the only one to do so either, as the song saw many competing versions hit the market in the spring of 1949 – Lionel Hampton of all people was the other who cracked the charts with a version of it and Big John Greer cut a decent take on it as well – and so while everyone at King Records at the time surely felt they’d reached their goal when Harris did so well with this, if those people were around today and were judging it by its long-term reputation rather than its immediate sales the answer to that question might just be a little bit different. It’s always hard to try and envision the mindset of an artist long removed from this world, especially when that artist was never asked on record about his thoughts on his career beyond a few basic overviews. In Wynonie Harris’s case this is even more fraught with danger because of his notoriously massive ego which would preclude him from ever admitting to anything that wasn’t boastful, self-aggrandizing and positioned him as larger than life. But I think that factors into this unshakable perception of him at this stage too and that’s the realization that much of his success in rock by this point was with the work of other artists. This will be his fifth rock hit and both his chart topping Good Rockin’ Tonight and its big selling follow-up Lollipop Mama were covers of Roy Brown songs. Now here’s another cover song that is pulling in the sales. What did his ego think about all this? By the sounds of it, at least to start, he might have been less than pleased. Harris’s greatest natural attribute was always his vocal enthusiasm. A robust delivery that conveyed the emotions inherent in the lyrics – be it suggestiveness, horniness, devilment or other juicy topics as was often the case, or just generalized excitement for yet unknown crimes against good taste and morality. Yet on his celebrated cover songs you get the sense at times, even on the best of them, that he’s not fully committed, that he’s perhaps resentful of being asked to imitate somebody else. That would seem to be the case with Drinkin’ Wine Spo-Dee-O-Dee as well because for a song topic that is tailored made for him Harris comes across as somewhat listless to start with. Stick McGhee sang this with a very noticeable bounce to his voice. He wasn’t so revved up that he was out of control, overly excited at the prospect of imbibing in some spirits as if he were a 15 year old who found the key to his folks liquor cabinet when they went out for the night, but rather he gave the impression that this was something he and his buddies did each Friday night and was a highlight of their week. Harris by contrast sounds like he’s being forced to sing enthusiastically to suit the wishes of the producers at the label and while his voice might hit the right emphasis along the way there doesn’t seem to be much conviction in how he says it. This might be exacerbated by the backing which is done – somewhat surprisingly – by our friend Joe Morris and his stellar crew. Morris of course was a fixture with Atlantic Records this past year and not prone to doing session work for other labels, but they somehow found their way to New Jersey where Harris was brought in for this date in April. Though its timing would suggest that it was a rush job in order to get down a quick version of a rising seller – on the Atlantic label no less, so Morris’s involvement may be viewed as treasonous in some circles – but that doesn’t seem to be the case as they cut a handful of songs including some great sides that made up future hit singles so that says they either got lucky if this WAS a hastily convened session, or it was one planned all along and they just happened to settle on Drinkin’ Wine as merely one of the sides to try their hand at. But anyway, as to the backing by Morris and company, they’ve added a group vocal echoing Harris on the line chorus, sort of a shouted sing-along which doesn’t quite add anything to the proceedings. In fact it comes across as a bit artificial, like they needed to convince you of a feeling of excitement that wasn’t actually present. As for their playing, while they have their moments they also seem chaotic and disorganized at times, clashing with Harris – not because they’re playing in a style ill-suited for him like we’ve seen too often in the past – but because their own rock instincts are actually at risk for overwhelming Harris. But thankfully this also has the benefit of lighting a fuse under Wynonie who promptly spends the second half of the record in an attempt to match their vitality. Certainly the two entities should be engaging in a shared ambition to take things to another level but it’s telling that Harris needs them to spur him on. When Harris shouts “Look Out!” about a minute into the proceedings things take off… at least in terms of exuberance. The horns start ramping up their playing, Harris starts to ad-lib, the others are chanting “Wine Wine Wine” and it all sounds as rowdy as you’d expect when you mix Wynonie Harris, an eager audience (in this case the band and engineers and any hangers on in the studio) with “gallons of wine” (he of course is responsible for the shift from bottle to gallon, as if you needed me to tell you that). But sounding lively isn’t quite the same as being effective and here’s the other disconnect, though I’m sure one that’s bound to be overlooked even if you aren’t partaking in the drinking festivities yourself. They’re all making lots of individual noise but there’s no cohesion to it. Johnny Griffin’s saxophone is headed in one direction while Morris’s trumpet is going somewhere else, all while Harris is rampaging around like a wild stallion. It’s plenty boisterous and certainly conjures up the right atmosphere for such activities but it’s hardly amounting to much in a musical sense. As was frequently his habit Harris substitutes his own lines for those that were written and while nothing is out of place, I mean he could probably riff on the subject of booze for hours on end like a Senate filibuster, the song’s flow and structure were tied to specific cadences and references and those get upended here. In the process this eliminates some of the flow of the story and its inherent sing-along nature that had made the original so memorable. Now if you’re drunk and disorderly yourself all of this hardly matters. They’re fulfilling their primary duty of making sure it sounds as if you’re hip-deep in the empty bottles strewn about. We’ve all been to parties like this and before you pass out the last thing you remember probably sounded a lot like what you hear on Drinkin’ Wine Spo-Dee-O-Dee. Wild unruly noise with people stumbling about and tripping over one another like the musicians do here, with some brash loudmouth like Harris making sure everybody knows he’s in the middle of it all. I’ll admit that can be plenty of fun when you’re stewed to the gills and in that setting this record is enjoyable enough to recommend. To go back to the question about goals at the beginning of this party… err, review… it sure wasn’t to create some lofty piece of art, but rather to get a hit and keep the party swinging. For Harris it did just that, a hit is the ultimate form of validation after all, certainly for the record label as well as to satisfy his own ego, but in the bigger picture that we must look at here the results aren’t so clear cut. Wynonie Harris had regained his artistic equilibrium the first time around in early 1948 after a long career lull by latching onto the musical innovations of another artist, not once but twice, when he covered both sides of Roy Brown’s debut. That he managed to do so in a way that improved upon Brown’s tentative approach and had gotten two huge hits out of it AND in doing so had legitimized rock’s claim to be taken seriously as an upstart genre were all points in his favor. Whatever demerits he might receive for lack of originality or for not being the visionary that Brown himself had showed himself to be could be excused when the results were so crucial in establishing rock ‘n’ roll’s image and commercial clout. But that’s no longer the case. Rock has proven its validity and appeal beyond question by mid 1949 and no longer simply needed someone to herald its arrival. Furthermore unlike in that previous example with Good Rockin Tonight and Lollipop Mama where the originals were in danger of never being widely heard and thus might not ever have their innovations fully recognized without Harris bringing them to a larger audience, that’s obviously NOT something that was at risk with Stick McGhee this time around. McGhee’s record was currently zooming up the charts and finding an eager and broad audience for its wares and all Wynonie Harris and King Records were doing was trying to undercut a rival’s success. You could even argue that if were they successful at it and sent McGhee’s record tumbling it would’ve had disastrous long term effects on rock’s prospects. You NEVER want to restrict the outlets for a growing movement, even if that means your own place in that movement isn’t as ironclad once more competition arrives to challenge your dominance. The ascension of those rivals only strengthens the overall genre. If all rock had going for it was Wynonie Harris then rock would’ve died out once his own hits dried up and by trying to steal the hits of others he was doing everybody a disservice. We have to be fair about it and admit this type of approach of a bigger name on a stronger label covering a hot record by a relative unknown on a smaller label was common practice in 1949 and nothing to get morally outraged about. But that doesn’t mean we should ignore the drawbacks of such actions, nor does it prevent us from taking a rooting interest in the outcome. The better performance SHOULD win out commercially and in this case it certainly did. McGhee’s was appreciably better AND the bigger hit (#2 on those charts). But McGhee’s commercial victory also was the better result for rock as a whole and that unquestionably was the bigger story here. King Records had a deep roster of hit makers in rock, starting with Harris and Ivory Joe Hunter, but as indicative of their growing economic might they also had recently brought into the fold Roy Brown himself when they acquired DeLuxe Records, as well as taking over the contract of Gotham’s Earl Bostic and Sensation’s Todd Rhodes. Had they also been able to snuff out Atlantic’s dreams of reaching the big time and perhaps sent them into bankruptcy then think of the ramifications down the road. There’d be too many eggs in one basket and should King’s basket break and there were fewer viable rock labels left to pick up the slack the results could’ve been disastrous for rock ‘n’ roll’s long term survival. While Harris was an obvious choice to connect with a song called Drinkin’ Wine Spo-Dee-O-Dee he wasn’t the IDEAL choice, even if his version still was potent enough to get you over the legal limit. In the end we’re glad the bartender cut him off before he caught up to McGhee. Sometimes the best decision is just knowing when you’ve had enough. Harris has had enough name recognition that he didn’t need one more headline over someone still seeking their first. We’ll call you cab, Wynonie… even if we’ll still let you take the bottle you absconded with back to your room for a nightcap. 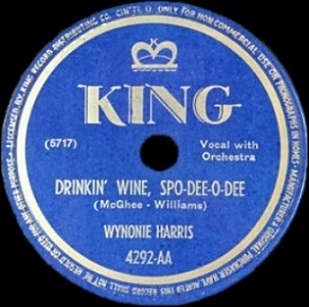 Leave a reply on "Wynonie Harris: “Drinkin’ Wine Spo-Dee-O-Dee”"